Hermann studied Architecture at the University of Innsbruck and Columbia University, New York, where he received his Masters in Advanced Architectural Design (’00) and was awarded the Kinne Fellows Prize. He is the principal of 2n – a New York based data visualization design agency. His work at 2n has earned him numerous awards including three consecutive awards for Design Excellency from Communication Arts (2010, 2011 & 2012) as well as four Webby Award nominations. His Levine & Walker installation was shown at the 2011 Rencontres d’Arles in the group show FROM HERE ON, (curated by Clément Chéroux, Joan Fontcuberta , Erik Kessels, Martin Parr, and Joachim Schmid) as well as at the FoMu in Antwerpen and the Centre d’Art Santa Mònica, Barcelona. In 2012 his books were part of the ABC/POD show at Printed Matter, New York and the DIY: Photographers & Books exhibition at the Cleveland Museum of Art. Together with artist Jeff Brouws and Wendy Burton he worked on Various Small Books, a book about books about books made in homage or referencing the Artist Books of Ed Ruscha, published by MIT Press in the Spring of 2013. 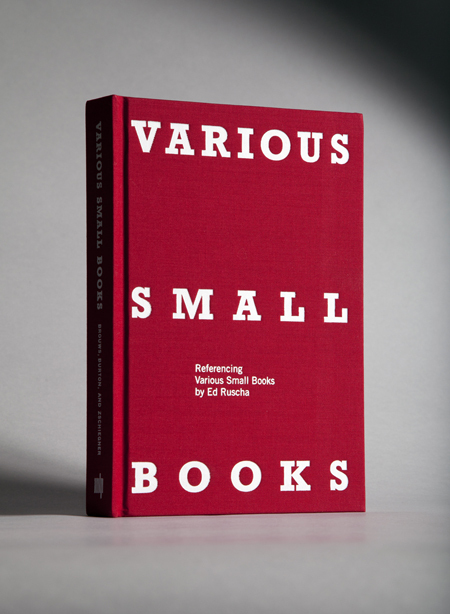 He was a co-curator for Ruscha & Co, an exhibition of Ed Ruscha’s legendary artist books together with books and works of art by more than 100 contemporary artists, most of them featured in Various Small Books. Hermann is a member of the ABC Artists’ Books Cooperative. To purchase some of his books please visit the online bookstore.